GuocoLand Limited (the “Company“) is committed to maintaining high standards of corporate governance and endeavours to continuously keep abreast of new developments and practices in corporate governance. During the financial year ended 30 June 2018 (“FY2018”), the Company supported the Corporate Governance – Statement Of Support 2017 (organised by the Securities Investors Association Singapore) to demonstrate its commitment to uphold high standards of corporate governance to enhance shareholders value. The Company has established its own Code of corporate governance (“Company Code”) comprising the terms of reference for the Board of Directors and its Committees which are substantially in line with the principles and guidelines of the Code of Corporate Governance 2012 (“Code 2012”). Such terms of reference are being reviewed periodically and updated as appropriate. During the FY2018, the Company adhered to the provisions of the Code 2012 as presented below. The Company is headed by an effective Board which oversees the business affairs of the Group. The Board carries out this oversight function by assuming responsibility for effective stewardship and corporate governance of the Company and the Group. considering sustainability issues including environmental, social and governance factors as part of the Company’s overall strategy. The Board also sets the Company’s value and standards through codes of conduct and corporate policies and procedures handbook which are being emphasized regularly to serve as constant reminders to its executives. The Company has a strong corporate culture exemplified by its core values which are set out in the Company’s intranet system and readily accessible by employees. In accordance with the listing rules of the Singapore Exchange Securities Trading Limited (“SGX-ST”), the Company has issued its Sustainability Report for FY2018 (“SR 2018”) which describes inter alia, the Company’s sustainability governance and practices in the Group’s business operations and dealings with its stakeholders. The Environmental, Social and Governance (ESG) factors that are material to the Company and its stakeholders have been identified and are also described in the SR 2018. Each Board committee reviews the matters that fall within its respective terms of reference and reports its decisions to the Board which endorses and accepts ultimate responsibility on such matters. The Company Code sets out the matters which require the Board’s approval. During the year, the Board reviewed and approved the business plan and budget, major investments including joint venture transactions, Directors’ Statement and audited Financial Statements for FY2018, the financial results announcements of the Company and interested person transactions which required announcements to be made. Newly appointed Director(s) to the Board will be issued a formal letter by the Company and furnished with an induction package comprising meeting schedules of the Board and its Committees, the Company’s latest Annual Report, Company Code, materials on corporate overview such as corporate structure, strategic business units, Guidebook on being an Effective Director, Code 2012 and Guidebook setting out the duties and obligations of Directors of the Company, etc. When a Director is appointed to a Board Committee, it is the Company’s practice to highlight the relevant terms of reference to such Director and provide a copy of the related Guidebook for the Committee. New Directors will also be encouraged to attend the Listed Company Director programmes (where appropriate) conducted by the Singapore Institute of Directors (“SID”); and Director Financial Reporting Essentials co-organised by SID and the Institute of Singapore Chartered Accountants and supported by Accounting and Corporate Regulatory Authority (“ACRA”), where relevant. All Directors are provided with relevant information on the Company’s policies, procedures and practices relating to governance matters, including disclosure of interests in securities, dealings in the Company’s securities, restrictions on disclosure of price sensitive information and declaration of interests relating to the Group’s businesses. The Company will arrange for new Directors to attend the training in the relevant areas as appropriate. All Directors are updated regularly on key regulatory and accounting changes and risk management at Board meetings. During the FY2018, Directors attended training programmes and seminars organised by SID such as SID Directors Conference 2017 and Master classes for Directors. Directors are also informed of other training programmes and seminars organised by SGX-ST, ACRA and KPMG. The NC has reviewed the training and professional development programmes attended by Directors and supported by the Company. To further enhance the Directors’ understanding of the Group’s business, they had visited the Group’s development projects in Singapore as well as overseas operations. The Board currently consists of ten Directors. On an annual basis, the NC determines the independence of the Directors based on the definition of independence and guidance on relationships which could deem a director not to be independent as set out in the Code 2012 e.g. relationship with the Company, its officers, related corporations and major shareholder(s). For the year under review, all Directors had made declarations on their respective status of independence which were submitted to the NC for review. The NC had determined that Mr Moses Lee Kim Poo, Mr Timothy Teo Lai Wah, Mr Francis Siu Wai Keung, Mr Abdullah Bin Tarmugi, Ms Lim Suat Jien and Ms Jennie Chua Kheng Yeng are independent. Mr Timothy Teo Lai Wah, who is also a member of the NC and had served on the Board for more than 9 years, was subjected to particular rigorous review of his independence by the remaining NC members. The NC had after due and careful rigorous review determined that Mr Teo remained independent, taking into account that Mr Teo continued to demonstrate strong independence in character and judgement in the discharge of his responsibilities as an Independent Director. He had also actively expressed his independent opinions as well as made suggestions and recommendations for the benefits of the Company. Mr Teo who has in-depth understanding of the Group’s business continued to contribute to the Company based on his experience and knowledge of the industry in which the Group operates and markets that it competes in. Based on Mr Teo’s declaration of independence, he has no relationships or circumstances that could or were likely to affect his judgement and ability to compromise his independence and discharge of his duties as an Independent Director. During the review, Mr Teo had recused himself and abstained from all deliberations and discussions. The Board had accepted the assessment of Directors’ Independence by the NC. Based on the NC’s review of independence, the Board is satisfied that there is a strong and independent element on the Board with six out of ten Directors, constituting more than 50% of the Board, being independent. The Board, having taken into account the review by the NC, considers its present size of ten Directors to be adequate to facilitate effective decision making for the current nature and scope of the Group’s business operations. The NC conducted its annual review on the composition of the Board which comprises ten well-qualified members with diversified skills, experience, knowledge, gender and providing core competencies in the areas of accounting, financial, banking, legal, business management and industry experiences such as property development and hotel operations. To enhance the Board’s competencies, induction programme will be conducted for newly appointed Directors as described under Principle 1 above. The Board considers its current composition with a balanced mix of skills as appropriate for the existing needs and demands of the Group’s businesses. There are currently two female Directors which make up 20% of the total Board size of ten Directors. The Company recognises the importance and benefits of diversity on the Board as this would enhance the effectiveness of the Board in terms of varied perspectives, skills, industry discipline, business experience, gender, background and other distinguishing factors/qualities. Non-Executive Directors are encouraged to constructively challenge and help develop proposals on strategy. During the FY2018, Non-Executive Directors had met without the presence of Management. The Board Chairman, Mr Moses Lee Kim Poo is an Independent Director. There is clear division of responsibilities in the respective roles and functions of the Chairman, Mr Lee and the CEO, Mr Raymond Choong Yee How. There is no familial relationship between Mr Lee and Mr Choong. The Chairman leads the Board and ensures its smooth and effective functioning. The CEO is responsible for the vision and strategic direction of the Group, implementing the policies and decisions of the Board, initiating business ideas and corporate strategies to create competitive edge and enhancing shareholders wealth, setting the benchmark and targets for operating companies, overseeing the day-to-day operations and tracking compliance and business progress. The CEO also holds regular meetings with senior management and on a quarterly basis, updates the Board on progress made on corporate strategies and operational targets that were pre-set. As the Chairman is independent from the Company’s officers, related corporations and major shareholder(s); and the Directors and Management are accessible by the Company’s shareholders, the appointment of a lead independent director is deemed to be not necessary. Mr Kwek Leng Hai, Member (Non-Independent Non-Executive Director). reviews Board succession plans for Directors. The Company has in place a process for the selection and appointment of new Directors to the Board which has been followed by the NC. Factors considered by the NC include the relevant skills that the Company sought such as strategic planning, business and management experience, industry knowledge e.g. real estate, hotel operations, etc. In the selection and appointment of a new Director, candidates may be put forward or sought through internal promotion, contacts and recommendations from Directors/substantial shareholders or external sources, when appropriate. The NC will review the profile of the candidate proposed for appointment, having regard to the competencies, skills, professional expertise, experiences, background and track record, and make recommendation to the Board on the appointment of new Director. The NC is also tasked to review succession and renewal plans for Board continuation. As prescribed by the Company’s Constitution and recommended by the Code 2012, one-third of the Directors for the time being are required to retire from office and are individually subject to re-election by shareholders at the Company’s AGM. Every Director is required to retire from his/her office and is subject to re-election at least once in every three years. The NC will review the contributions and performance of the Directors who are retiring at the AGM to determine their eligibility for re-nomination. The NC also took into consideration Directors’ number of listed company board representations and other principal commitments, and is satisfied that each Director is able to and has been adequately carrying out his/her duties as a Director of the Company. The Board has reviewed and is satisfied that Directors’ current directorships in other listed company boards and their other principal commitments did not affect their time commitment to the Board of the Company and has accordingly not made a determination of the maximum number of board representations a Director may hold. Key information of each member of the Board including date of first appointment as a Director, date of last re-appointment/re-election, academic and professional qualifications, background and experience, directorships or chairmanships in other listed companies and principal commitments over the past 3 years, and other relevant information can be found in the “Board of Directors” section of this Annual Report. On an annual basis, the NC assesses the effectiveness and performance of each individual Director, the Board Chairman, the Board as a whole and each Board Committee. Each Director carried out a self-assessment on his/her performance based on evaluation criteria such as his/her contributions to the functions of the Board, participation and attendance at Board Meetings, his/her competency, expertise and skills as well as knowledge of the Group/Company’s business and the industry in which the Group/Company operates in. The Chairman has also carried out a self-assessment of his performance with particular emphasis on his role and responsibilities as a Chairman based on criteria drawn from the guidelines as set out in SID’s NC Guide, including conduct of meetings of the Board and shareholders, leadership, communication and interaction with Directors, shareholders and other stakeholders, possession of high level of ethics/values, etc. Each Board Committee Chairman evaluated his respective Board Committees, taking into account the respective Board Committees’ roles and responsibilities as well as the contributions of members to the functions of these Committees. All Directors participated in the assessment process and submitted their respective completed and signed assessment forms to the Company Secretary for collation and presentation to the NC for evaluation. The NC had evaluated the collective Board performance, taking into account the self-assessment conducted by individual Directors and the Board Chairman as well as the performance of each Board Committee. In assessing the Board’s performance as a whole, the NC had considered the Board’s integrity, competency, responsibilities, governance and organization as well as team dynamics. The NC also carried out an evaluation and review of the contributions of Directors at meetings of the Board and Board Committees and Directors’ participation in the affairs of the Company, including a review of matters such as the independence of Directors, their individual skills, experience and time commitment, in particular for Directors who served on multiple boards as well as the overall Board size and composition. On the basis of the aforesaid evaluation, the NC is satisfied that for the FY2018, the Board and its Committees had been effective in the conduct of their respective duties and the Directors have each contributed to the effectiveness of the Board and its Committees (as applicable). The results of the NC’s assessment had been communicated to and accepted by the Board. In order to enable the Directors to make informed decisions in the discharge of their duties and responsibilities, Management recognizes the importance of providing the Board with relevant, complete and adequate information in a timely manner. Management furnished the Board with reports of the Company’s operations and performance, financial position and prospects for review at each Board meeting. Management also keeps the Board apprised of the Company’s operations and performance through separate meetings and discussions. To facilitate participation at meetings, Directors are provided with electronic devices to enable them to read reports/materials in real time once these are being uploaded to a secured system accessible by all Directors. Directors have separate and independent access to the Company Secretary, whose role includes, inter alia, ensuring that Board procedures as well as applicable rules and regulations are complied with. The incumbent Company Secretary, Ms Mary Goh, has more than two decades of corporate secretarial experience in professional consultancy firms and public listed companies. Ms Goh is a Fellow of the Chartered Secretaries Institute of Singapore. She holds a Master of Business Administration Degree from the University of South Australia and a Master of Laws in Commercial Law from the Singapore Management University. The Company Secretary attends all Board and Board Committee meetings; and ensures that board procedures are followed and that applicable rules and regulations prescribed by, inter alia, the Companies Act (Chapter 50) and the SGX-ST Listing Manual are complied with. She also advises the Board on all governance matters, as well as assisting with the co-ordination of training and professional development for Board members. Directors have access to independent professional advice at the Company’s expense, in consultation with the CEO of the Company. Ms Jennie Chua Kheng Yeng, Member (Independent Non-Executive Director). No member of the RC was involved in deciding his/her own remuneration. The terms of reference of the RC are set out in the Company’s Code and its duties include, inter alia, reviewing and recommending to the Board a framework of remuneration for the Board and key management personnel, reviewing and recommending to the Board for the Board’s endorsement with the specific remuneration packages for each Director as well as for the key management personnel; and the administration of the Company’s Executives’ Share Option Scheme (“ESOS”). In its review and recommendation for the remuneration framework, the RC took into account the performance of the Group, the individual Directors and key management personnel, linking rewards to corporate and individual performance. The RC also took into account industry practices and norms in remuneration to ensure that the remuneration packages for Directors and key management personnel are competitive to attract, retain and motivate Directors and key management personnel to provide good stewardship and effective management for the Company. Such remuneration framework is being reviewed on an annual basis to ensure that they remain relevant. The RC may seek remuneration consultants’ advice on remuneration matters for Directors as it deems appropriate. For the FY2018, the RC did not require the service of an external remuneration consultant. As regards the Company's obligations arising in the event of termination of service contracts, the Company does not provide any termination, retirement or post-employment benefits to its Directors, CEO and key management personnel (who are not Directors or the CEO). The Company’s remuneration structure for key management personnel comprises both fixed and variable components. Fixed component includes, inter alia basic salary whilst variable component includes performance-linked incentives which are described in more details below. To promote staff motivation, the Company established a remuneration framework comprising both short-term and long-term incentives that are linked to performance. Short-term incentives include performance-linked variable bonus. For the purpose of assessing the performance of the CEO and key management personnel of the Group, specific Key Result Areas (“KRA”) including both financial and non-financial measures are set for each financial year. An annual appraisal is conducted taking into consideration the achievements of the pre-set KRA for the CEO and each key management personnel. To promote long-term success of the Company, long-term incentives in the form of affirmative action bonus and value creation incentive are also incorporated in the remuneration framework of key management personnel. The Company also has a performance-linked ESOS. Non-Executive Directors do not receive any salary. However, Non-Executive Independent Directors receive Director fees that are based on corporate and individual responsibilities and which are in line with industry norm. The Company does not have any contractual provisions to reclaim incentive components of remuneration from Executive Director(s) and the key management personnel in any circumstances. Having considered the guidelines in the Code 2012 on the disclosure of remuneration of Directors and CEO, the RC is of the view that it is appropriate to provide full disclosure of fees proposed to be paid to Directors for the FY2018 which aggregate to S$647,305 and will be tabled at the forthcoming AGM under Agenda Item No. 3 for shareholders’ approval. As regards the disclosure of remuneration of the CEO who is also an Executive Director of the Company, for the financial year under review, the Company took into account the very sensitive nature of the matter and the highly competitive business environment in which the Group operates and the impact such disclosure would have on the Group, and is of the view that the current disclosure on a named basis and in bands of S$250,000 (including the provision of a breakdown in percentage terms) is sufficient. For the FY2018, there were 20 million share options granted to the CEO. In determining the remuneration packages of the Group’s top key management personnel, factors that were taken into consideration included their individual responsibilities, skills, expertise and contributions to the Group’s performance and whether the remuneration packages are competitive and sufficient to ensure that the Group is able to attract and retain executive talents. 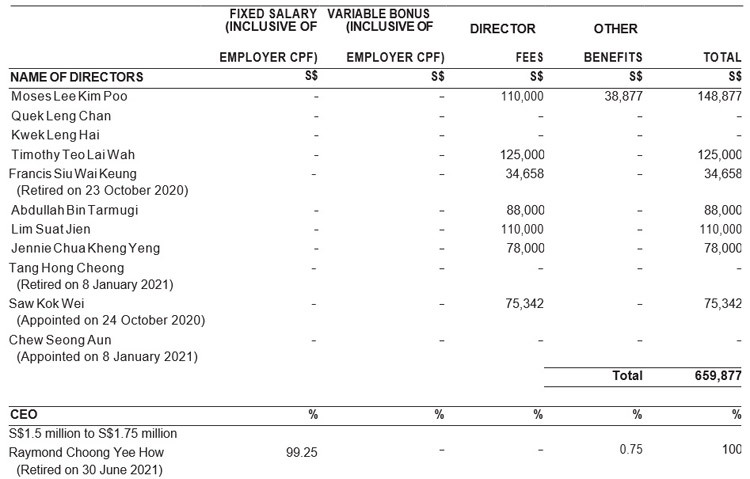 On the disclosure of remuneration of the Group’s top key management personnel, the Company is of the view that it would not be in its best interest to make such disclosure on a named basis in bands of S$250,000 with breakdowns of each key management personnel’s remuneration earned through base/fixed salary, variable bonuses, benefits in kind, etc. Accordingly, such details are not disclosed as the Company believes that in view of the competitive nature of the human resource environment and to support the Company’s efforts in attracting and retaining executive talents, it should maintain confidentiality on employee remuneration matters. As regards the Company’s ESOS, the details of which are set out in the Directors’ Statement and Note 29 to the Financial Statements. For the FY2018, the Company has announced an aggregate grant of 39.7 million share options to the CEO and certain key management personnel. During the financial year, there was no termination, retirement and post-employment benefits granted to Directors, the CEO and the top 4 key management personnel (who are not Directors or the CEO). The Company and its principal subsidiaries do not have any employees who are the immediate family members of any of the Directors or the CEO and whose remuneration exceeded S$50,000 for the FY2018. The Board is committed to provide shareholders with a balanced and understandable assessment of the Company’s financial performance, position, and prospects. Such information are furnished through the Company’s announcements of its quarterly, interim and annual financial results and press releases (where appropriate) to the SGX-ST.
Directors are updated regularly on key legislative and regulatory requirements so that appropriate systems and procedures and/or policies may be established and implemented to ensure compliance. On a quarterly basis, the Company Secretary would update the Board on salient laws and regulations that might have an impact on the Company or the Group’s business operations. In addition, the Board is provided with management accounts explaining the Group’s financial performance and operations update on a regular basis. Such reports enable the Board to make a balanced and informed assessment of the Group's performance, position and prospects, and Directors are kept abreast of the Group’s business activities. The Board recognizes the importance of risk management and the need to establish a sound system of internal controls to safeguard shareholders’ interests/investments and the Group’s assets. The ARC has been tasked to assist the Board to oversee the governance of risks and monitors the Group’s risks through an integrated approach of enterprise risk management, internal control and assurance systems. As part of the Group’s enterprise risk management, the key risks faced by the Group on an enterprise wide level as well as those faced by each key strategic business unit had been identified. Key risks faced by the Group include competition risks, investment and divestment risks, timely completion and delivery of projects, property management, etc. Financial risks are set out in Note 33 to the Financial Statements. A system of rating such potential risks has been established to identify tolerance level for the various classes of risks and determine the likelihood of the occurrences of such risks. The requisite internal controls and strategy to mitigate these potential risks such as risks relating to information technology, disruption and cyber security risks, are also recorded and tracked in the Group risk register. A Business Continuity Plan, which outlines the potential disaster scenarios that may have material adverse impact to the business operations as well as the mitigating recovery process supported by information technology disaster recovery plan, had been drawn up as part of the enterprise risk management of the Group. To ensure the adequacy and effectiveness of the company's risk management and internal control systems, including financial, operational, compliance and information technology controls, the ARC reviews the Group risk register on a quarterly basis with key risks profile update on a half-yearly basis. The internal auditors (“IA”) and risk manager will validate the internal controls and risk treatment plans respectively for each of the key risks while the external auditors will highlight any material internal control weaknesses that had come to their attention in the course of their audit. The findings of the IA and external auditors as well as the risk manager will be brought up to the ARC which will in turn highlight any issues or matters arising from the Group risk register and update on key risks report to the Board. A robust process had been put in place whereby each business unit provided a quarterly financial status declaration to the CEO and Group Chief Financial Officer (“CFO”). Such declaration would confirm, inter alia, that the consolidated accounts of the business units were correct and had been prepared in accordance with the Group’s accounting policies and on a basis consistent with that of the preceding quarter. This process together with the findings and assurance from the IA with regard to the adequacy and effectiveness of the Group’s internal controls to address financial, operational, compliance and information technology controls and risk management systems, had facilitated the CEO and CFO to provide the assurance as stated in the paragraph below, to the Board. The Board has received assurance from the CEO and the CFO that the financial records of the Company have been properly maintained and the financial statements give a true and fair view of the Company’s operations and finances, and the Company’s risk management and internal control systems are effective and adequate. Having regard to the reviews carried out by the ARC, findings raised by IA and external auditors and assurance from the Management and IA, the Board, with the concurrence of the ARC, is of the opinion that the Group’s internal controls addressing financial, operational, compliance and information technology controls and risk management systems, were adequate and effective as at 30 June 2018. Ms Lim Suat Jien, Member (Independent Non-Executive Director). A majority of the ARC members have recent and relevant accounting or related financial management expertise or experience and the Chairman of the ARC has extensive global experience in the financial industry. The profile of the ARC Chairman and its members are presented under the “Board of Directors” section of this Annual Report. The Board is satisfied that such members are appropriately qualified to discharge their responsibilities. The terms of reference of the ARC are set out in the Company’s Code which provided, inter alia, that the ARC has explicit authority to investigate any matter within its terms of reference, have full access to and co-operation by Management and have full discretion to invite any Director or executive officer to attend its meetings, and reasonable resources to enable it to discharge its functions properly. reviewing interested person transactions where they exceeded the relevant threshold levels or as required by SGX-ST Listing Manual. In its review of the financial statements of the Group and the Company for the FY2018, the ARC has discussed with both the Management and the external auditors the accounting principles that were applied and their judgement of items that might affect the integrity of the financial statements. 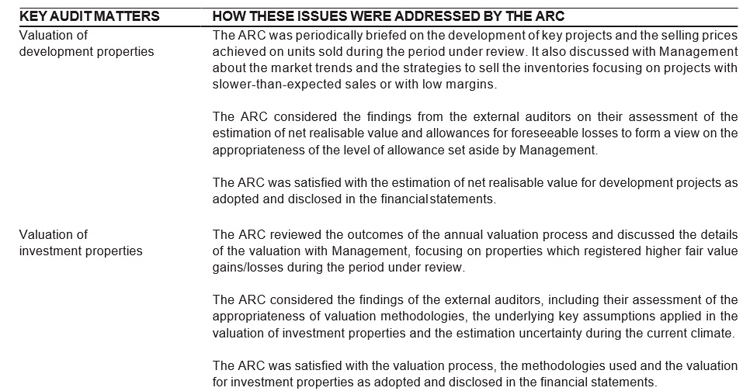 The ARC reviewed, amongst other matters, the following key audit matters as reported by the external auditors for the FY2018. Detailed information on the key audit matters included in the Independent Auditors’ Report. The Company’s internal policy requires the ARC to note and review IPT, as recorded in the Company’s Register of IPT. Directors are required to disclose their interest and any conflict of interest in such transactions, and will accordingly abstain from the deliberation and voting in resolutions relating to these transactions. For each material/significant IPT, key information pertaining to the IPT together with the identification of relationship of each party is provided to the ARC for review and evaluation. The ARC will review the IPT to ensure that the terms are fair and at arms’ length, and not prejudicial to the interest of the Company and its minority shareholders. In the event that the relevant threshold as stipulated in the listing rules of SGX is met, the IPT including the interested person(s) and its or their relationship with the Company, will be announced via SGXNET or put to vote by disinterested shareholders at the Company’s general meeting as the case may be. The type, nature and value of significant related party transactions during the financial year under review are listed in Note 31 to the Financial Statements. The external auditors keep the ARC apprised of any changes to the accounting standards and issues which have a direct impact on the Company’s Financial Statements periodically at the ARC meeting. The Company has complied with Rules 712, 715 and 716 of the Listing Manual issued by SGX-ST in relation to the appointment of its external auditors. The Company has its own in-house qualified internal audit team comprising the Head, Internal Audit, Mr Jason Ho, and his team of qualified personnel. The Head, Internal Audit’s primary line of reporting is to the Chairman of the ARC, although he reports administratively to the CEO. IA assists the ARC to review and assess the adequacy and effectiveness of the Group’s internal controls based on the COSO Internal Control Integrated Framework to ensure no material weaknesses in respect of financial, operational, compliance and information technology. The IA also audits the operations of the Group to ensure regulatory compliances as well as adherence to Group policies and procedures. The scope of IA’s reviews is set out in IA’s annual work plan which is approved by the ARC. During the FY2018, IA had carried out its function according to the Standards for the Professional Practice of Internal Auditing set by The Institute of Internal Auditors (IIA). The ARC reviews the adequacy and effectiveness of the internal audit function to ensure that the internal audits are conducted effectively and the Management provides the necessary co-operation to enable the IA to perform its function. The ARC also reviews the IA reports and remedial actions taken by Management to address any internal control weaknesses that had been identified. The Company believes in treating all shareholders fairly and equitably by recognizing, protecting and facilitating the exercise of shareholders’ rights, and continually reviews and updates such governance arrangements. The Company currently has one class of shares in issue being ordinary shares which carry one vote for one share held. The Company also believes in providing sufficient and regular information to its shareholders on the development of the Company’s business and financial performance that could materially affect the price or value of the Company’s shares. To facilitate shareholders’ participation at general meetings of the Company, detailed information is provided to shareholders in reports/circulars. Notices of general meetings which set out the resolutions to be tabled to shareholders for approval together with proxy forms are sent to all shareholders by post, published in a local newspaper, announced via SGXNET and uploaded on the Company’s website. General meetings are held at venue easily accessible by shareholders. Relevant rules and procedures governing the general meeting(s) including, in particular, the voting procedures are communicated to shareholders. Resolutions tabled at general meetings are passed through a process of voting by poll. A registered shareholder may appoint one or two proxies to attend and vote on his/her behalf at the Company’s general meetings. A relevant intermediary, as defined in the Companies Act (Chapter 50), may appoint more than two proxies to attend, speak and vote at the Company’s general meetings. In compliance with the continuous disclosure obligations provided in the listing rules of SGX-ST, the Company ensures timely and adequate disclosure of information on matters that may have material impact to the Group. To enhance communication with all stakeholders, the Company has established a corporate website http://www.guocoland.com.sg which is indicated on the Annual Report and a web-link is provided on the SGX-ST website. Information available on the Company’s website includes, inter alia, corporate structure and profile, development projects of the Group, financial results, Annual Reports, etc. The Company has a Corporate Communications & Investor Relations department, and regularly conveys to shareholders, information on the Company’s financial performance, position and prospects in the Company’s Annual Reports and on the Company’s website. In addition, the Company keeps shareholders apprised of the Group’s corporate development by disseminating press releases to the media which are also uploaded on the Company’s website and releasing announcements via SGXNET, when appropriate. Investors may also subscribe to receive the latest updates on the Group via the Company’s website. To facilitate access to pertinent information, a clearly dedicated “Investors & Media” link is provided on the Company’s website and its Corporate Communications & Investor Relations contacts e.g. email link is also available to facilitate communication. The Company’s Corporate Communications & Investor Relations team promptly attends to calls/email enquiries on the Group and endeavours to respond within 1 week. During the FY2018, the Company announced its unaudited quarterly results within 30 days for its first and third quarter ended. Its full-year audited financial results were announced within 60 days of the FY2018. The Company’s financial results are readily available on its website. In addition, a press release on the Company’s full-year audited financial results was disseminated to the media which was accordingly uploaded on the Company’s website and posted on SGXNET to ensure equality of information for all stakeholders. The CFO, together with the Corporate Communications & Investor Relations team carried out meetings with investors and analysts, where appropriate. As the Company embraces openness and transparency in the conduct of its affairs, it also ensures safeguarding of its commercial interest. In line with the Company’s sustainability efforts towards environmental conservation, from FY2018, the Company will make available its Annual Reports and Circulars/Addendums (the “AGM Document”) on its corporate website, in place of them being produced and distributed in the form of CD-ROMs. The Notice of AGM, Proxy Form and Request Form will be sent to shareholders to, inter alia, notify them of the AGM and the availability of the AGM Document on the Company’s website. Shareholders may, if they prefer, request for a printed copy of the AGM Document. The Company’s general meetings are the principal forum for dialogues with its shareholders where the Board and Management address shareholders’ concerns, if any. The Company may also solicit views or inputs of shareholders during general meetings. The Company does not have a fixed dividend policy. The amount of dividends depend on the Company’s earnings, cash flow, capital requirements, general financial and business conditions and other relevant factors as the Board deems appropriate. Embracing the consistent approach as in previous years, the Board will be proposing at the forthcoming AGM in October 2018, the declaration of a first and final tax exempt one-tier dividend of 7 cents per ordinary share in respect of the FY2018. The proposed dividend, when approved by shareholders at the AGM, shall be paid on 22 November 2018. At the Company’s general meetings, the Chairman invites shareholders to participate and provides them with the opportunity to ask questions as well as communicate their views on various matters affecting the Company. Separate resolutions are proposed for approval at general meetings on each substantially separate issue, for example, resolutions relating to payment of Directors fees, adoption of a new executive share scheme in place of the Company’s existing ESOS, the authorisation for issue of additional shares, re-appointment of the auditors and re-election of each Director, are separately proposed for shareholders’ approval. The rationale, information and explanation relating to each resolution are set out in the Notice of AGM. The profiles of each Director proposed for re-election as stated in the Notice of AGM are cross-referenced to the “Board of Directors” page in the Company’s Annual Report. Due to security concerns, the Company will not be implementing absentia voting methods such as by mail, email or facsimile. To promote effective shareholders’ participation and enhance transparency of the voting process at general meetings, the Company had since its 2012 AGM implemented electronic poll voting and will continue to adopt the electronic poll voting system at its forthcoming AGM in October 2018. The electronic voting procedures are presented to shareholders before the start of the AGM. Independent scrutineer has been engaged to count and validate the votes cast for or against each resolution which are tallied and displayed live on screen to shareholders immediately after each poll is conducted at the AGM. The results of the votes cast on the resolutions as well as the name of the independent scrutineer are also announced via SGXNET after the AGM. Minutes of the AGM which incorporated substantial comments or queries from shareholders and responses from the Board and Management are prepared and are available to shareholders upon request. All Directors, including the Chairman of the Board, the CEO and the respective Chairmen of the ARC, NC and RC as well as senior Management were present at the AGM to address any questions that shareholders may have. The Company’s external auditors were also present at the Company’s AGM to assist the Board in addressing any queries raised by shareholders. The Company’s Code provides guidelines to its officers in relation to dealings in securities. These guidelines set out, inter alia, that officers who are Directors of the Company or its subsidiaries must give notice in writing to the Company of the particulars of any dealings in the securities of the Company within 2 business days of such dealing or of any change in such particulars of which notice had already been given. The guidelines also provided that officers of the Group should refrain from dealing in any securities of the Company at any time when in possession of unpublished price-sensitive information in relation to those securities, and during the Company’s close period which is defined as two weeks immediately preceding the announcement of the Company’s quarterly results or half yearly results and one month preceding the announcement of the annual results, as the case may be, up to and including the date of announcement of the relevant results. Officers are also reminded to refrain from dealing in the Company’s securities on short-term considerations. These guidelines are disseminated to all Directors, officers and key management personnel of the Group on a quarterly basis to serve as reminder. The Company has established a Code of Conduct which is incorporated in its Employee Handbook. The Company’s Code of Conduct provides guidance to employees’ conduct in areas such as integrity in conducting business, prohibition on disclosure of confidential information relating to the Group, avoidance of conflict of interest, prohibition on accepting gifts/benefits from business associates, etc. The Employee Handbook is presented to all new employees during the induction program and the Company notifies employees of subsequent updates. The Board emphasizes the importance of professionalism and integrity when conducting business. Employees are required to embrace and practice these values in the course of performing their duties at work, and to act in the best interest of the Group at all time. The Company is committed to conduct business with integrity and high standards of corporate governance and conduct as well as compliance with applicable laws and regulatory requirements. In line with this commitment, the whistle-blowing policy is adopted to provide proper avenues/channels for employees and any other persons to raise or report any concerns/issues about serious wrong doings, misconduct, malpractices or improprieties in matters relating to the Group. The whistle-blowing policy sets out procedures and rules for employees and external parties to raise responsibly, in confidence, concerns about possible improprieties in the Group, without fear of undue reprisals. Whistle-blowers may raise potential issues through a dedicated secured email address or contact the ARC Chairman directly. The ARC oversees the whistle-blowing policy to ensure that arrangements are in place for independent investigation of matters raised and for appropriate follow-up action to be taken. The identity of the whistle-blower and person(s) being reported on are kept confidential. The whistle-blowing policy also allows for concerns or irregularities expressed anonymously to be considered, taking into account the seriousness and credibility of the issues raised. The Company’s whistle-blowing policy is published on its website.